(Life Defenders) Mamma Mia! Here We Go Again is the sequel to the, according to Wesley Morris of the New York Times, ‘wackadoo film’ of Broadway origin. Mamma Mia! Here We Go Again released this weekend and is currently #2 in box office revenue, just under Equalizer 2. Its predecessor was the highest-grossing musical of its time, earning a total of $615 million in box office revenue, and the Broadway play ran for 16 years to acclaim and many accolades. In it, the action cuts back and forth from the modern era to 1979 on the paradisiac Greek island, Kalokairi. 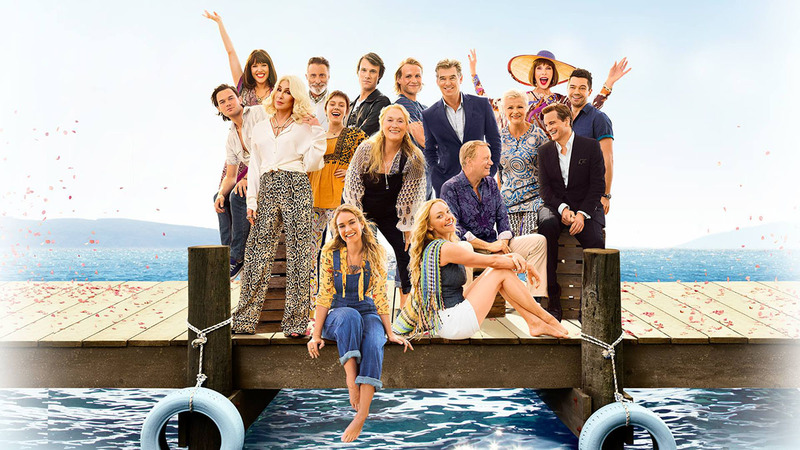 When the film begins, we learn that Donna has died and that her daughter, Sophie, is preparing to open a hotel on Kalokairi, a dream that Donna had had. In the previous film, the plot revolved the fact that a grown-up Sophie did not know whether her father was Bill, Harry, or Sam, and so, she meets all three, accepting them all as her fathers. In the 70s, a young Donna travels to this location, because she wants to make some memories. On her way to this destination, she meets a young man in Paris, Harry, and the two have a brief love affair. She leaves the next morning, having written a note telling him goodbye. While journeying to Kalokairi, Donna misses her ferry and is taken by boat by the dashing Bill, who has to leave but said he would return in a few weeks. While running for help during a rainstorm, she runs into Sam, and the two get cozy. A week into their relationship, she realizes he is engaged, and she tells him she that she cannot forgive him. He leaves the island, and Bill returns, fanning the mutual attraction between Donna and himself into a flame that burns brightly until this relationship abruptly ends. Donna realizes she is all alone – and pregnant. When the film cuts back to the modern era, her daughter, Sophie, also realizes that she is pregnant. The makers of this Hollywood film are plainly admitting that a pregnant character could have the solace of her unborn baby because they would have each other. A mere clump of cells does not have the power to give comfort or help anyone not be alone. Only a sentient being, a person can do that. Hollywood has admitted what those of us in pro-life have been saying for so long – an unborn child is separate, distinct, and an individual person from the mother. This is 1979. Abortion is legal in the United States, though not in Greece, and Donna could have easily hopped aboard a plane and traveled home. She does not, however, make that decision. She is by herself in a foreign country and without the child’s father, but she and her child are in this together, which gives her strength and courage. In the end, we see Donna bringing her baby to church, presumably, to be baptized, and she is confident in the role she has chosen. Sophie is also bringing her baby to the same church, and she experiences a deep connection to her mother in the final scene. In this film, mother, child, grandmother, and even great-grandmother are tied together through the shared strands of childbirth – an outcome abortion could never give. Though the relationships are not perfect, we see a celebration of life and of children, despite the circumstances that led to their arrival. Even the three fathers are in attendance with Sophie’s grand hotel opening, and, later, her baby’s christening, as one of them states, “family is the most important thing.” It can easily be argued that the whole plot of both movies is tied to the willingness of Donna to keep her child without so much of a thought of abortion. The tide may be turning if even Hollywood realizes that a person is a person even in the womb. Editor’s Note: This article originally appeared at Life Defenders on July 22, 2018, and is reprinted here with permission.